Finally the movie below shows how one can visualize the results in ESRI's ArcGlobe. More movies from the Redlands Institute on YouTube can be found here. 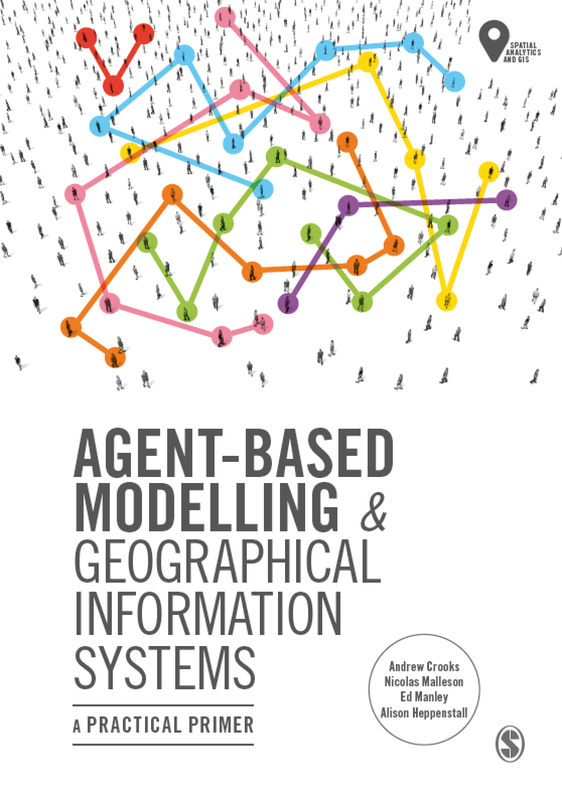 Following on from the UVA Bay Game post I thought it was about time to blog about Cormas and the ComMod (Companion Modeling Approach) which focus on participatory agent-based modeling for resource management. Why the interest? Take ecosystem management as an example, there are often many actors (stakeholders) who influence and control ecosystem management. For example, in the Chesapeake Bay there are farmers, local policy-makers, watermen, and developers. Such stakeholders have many different goals, associated feedbacks, negotiations etc... The question is how does one build models of such interactions? Often when we build models of such interactions we do not always engage with stakeholders directly. 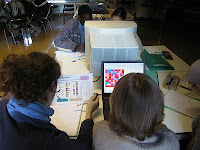 Participatory modeling approaches such as companion modeling offers one way for such engagement. It uses various techniques, including role playing games in the sense that models are built with the direct involvement of stakeholders. 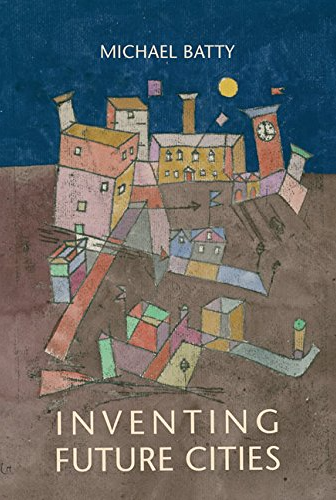 Where modelers develop and validate model rules in conjunction with those one is modeling. Such a direct involvement of stakeholders focuses our attention on how decisions are made and what are the problems rather than just simulating the effects (e.g. Gimblett et al., 2002). Barreteau, F.O. 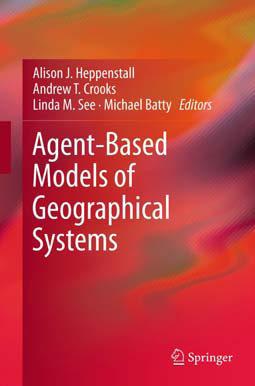 and others (2003), 'Our Companion Modelling Approach', Journal of Artificial Societies and Social Simulation, 6(1), Available at http://jasss.soc.surrey.ac.uk/6/2/1.html. Etienne, M. (2003), 'SYLVOPAST: A Multiple Target Role-Playing Game to Assess Negotiation Processes in Sylvopastoral Management Planning', Journal of Artificial Societies and Social Simulation, 6(2), Available at http://jasss.soc.surrey.ac.uk/6/2/5.html. Gilbert, N., Maltby, S. and Asakawa, T. (2002), 'Participatory Simulations for Developing Scenarios in Environmental Resource Management', in Urban, C. (ed. ), Third Workshop on Agent-Based Simulation, SCS European Publishing House, Passau, Germany, pp. 67-72. Ramanath, A.M. and Gilbert, N. (2004), 'The Design of Participatory Agent-Based Social Simulations', Journal of Artificial Societies and Social Simulation, 7(4), Available at http://jasss.soc.surrey.ac.uk/7/4/1.html. The Chesapeake Bay watershed is the largest estuary in the United States, its drainage basin covers 166,534 km2 in the District of Columbia and parts of six states: New York, Pennsylvania, Delaware, Maryland, Virginia, and West Virginia (Wikipedia). It is home to around 27 million residents and is suffering many deteriorating environmental conditions brought on by a broad range of individuals, communities and industries that live and work in its boundaries. 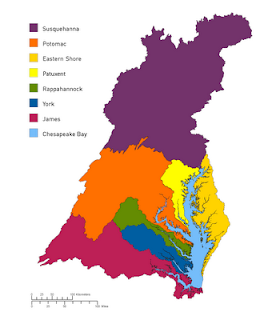 The University of Virgina (UVA) has developed an agent-based model called Bay Game to explore the issues relating to the Chesapeake Bay watershed. To quote the site, the UVA Bay Game "allows players to take the roles of stakeholders, such as farmers, local policy-makers, watermen, and developers, make decisions about their livelihoods and professional expertise, and see the impacts of these decisions on the watershed and on each other over a twenty-year period. The Game is an educational tool for raising awareness about watershed stewardship; a tool for exploring and testing policy choices; and a tool for basic research in complex systems modeling." More information about the UVA Bay Game can be found here. Below is a news clip featuring Philippe Cousteau who talks about the project.